In Seattle 300 people demonstrated June 1 at the U.S. Courthouse to denounce the Trump/Sessions’ racist separation of migrant families. The local protest, a Day of Action for Children, was part of a national day of such actions held all over the country. The family separation policy, announced by Attorney General Jeff Sessions on May 7, is an attack against people and families seeking asylum and protection at the U.S./Mexico border. Rally speakers said that 658 children had been ripped from their families by U.S. border forces during the first 13 days of this policy. As a result of Trump’s terroristic policies, families have lost track of their children, and do not know how to find them. Organizers at the rally announced that more actions and marches would be held around the country in the days and weeks ahead. 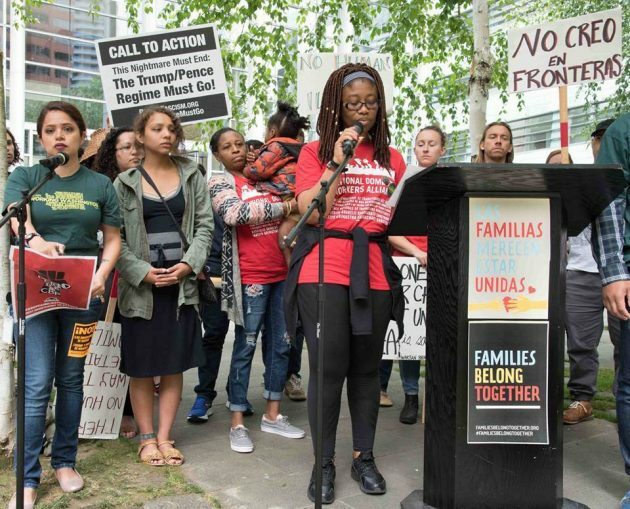 Participating groups included Moms Rising, Refugee Women’s Alliance, National Domestic Workers Alliance, Northwest Immigrant Rights Project and the American Civil Liberties Union.